This ride includes 18-mile alternate route option. See details below. Photos seen on this page are courtesy of Vermont Social. Ride day will begin at registration, where you will receive your cue sheet, a bib number to wear on the back of your jersey, and an event t-shirt. If you purchased a jersey, you will receive it at registration as well. Please be ready by 10:45 AM for a riders meeting prior to departure. Have questions about the ride? Click below to read our FAQ sheet, which we hope will offer all the answers you need. New in 2019, the Point to Point is offering an opportunity to explore Vermont’s back roads as part of cycling’s fastest growing segment. To really see Vermont, taking the dirt roads is a must, and there is no better way to hit the hardpack than by bike. 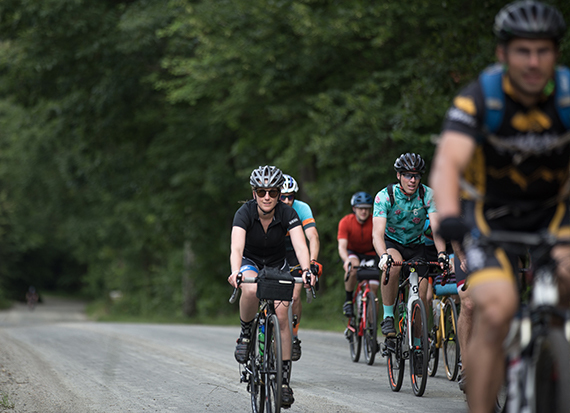 The Point to Point gravel ride is a 28-mile ride around the Ascutney Basin that provides a glimpse into the local countryside as you climb the rolling hills through horse country. The course is mildly challenging, as any tour of this area will be, with a couple of long climbs; a couple of short, steep climbs; and even some of Vermont’s famed class IV tracks to keep it exciting! Almost any kind of bike can be used—gravel bikes, cyclocross bikes, and mountain bikes will all feel at home on this course. Dedicated road bikes, however, aren’t going to be well-suited for the terrain. And while those class IV sections aren’t for the faint of heart, there is plenty of room and no shame in walking past a stretch! It’s not all climbing either. Starting at mile 10.3, riders will enjoy a gentle downhill grade for four miles leading into the first and only rest stop. After refueling, it’s time for the first Class IV section. Keep an eye on the signs here, because the 20-Mile Mountain Bike Ride shares the climb but heads off onto singletrack when the road crosses a small stony stream. Keep to the main road to the top of the hill. After descending the other side, there’s an opportunity to shortcut back to the P2P Festival at the Ascutney Outdoors Center at mile 15.6 (for an overall distance around 18 miles) for anyone who has had their fill, but the rest of the ride turns right onto Westgate Road, then right again for a short stretch on Route 44 West. You may see 25- and 50-mile riders coming in the other direction—don’t forget to wave hello! The next segment of course goes through one of Brownsville’s historic covered bridges, circles the cliffs of Little Ascutney Mountain, and climbs Ascutney Notch Road to the second Class IV. This paved section has a steep but short hike-a-bike, but soon after, riders will descend past the renowned mountain bike trail system, Ascutney Trails, and down the dirt road to join Route 44 for 200 yards. You’re soon back onto dirt, with Bible Hill Rd coming up across from the Town Garage, which leads to historic Bowers Covered Bridge. During Tropical Storm Irene in 2011, this bridge was lifted from its foundation and carried 100 yards downstream, coming to rest fully intact in a neighbor’s yard. After crossing the bridge, riders will cruise into and through the village of Brownsville before the final climb back to the Ascutney Outdoors Center and the P2P Festival. You don't have to hit the road alone. Create a team and bring your friends! Registering with a team is easy and fun! All rest stops will offer water, electrolyte drinks, and energy food. In order to manage the operations of the ride, cyclists must enter the rest stop prior to the cutoff time. Green Mountain Bike Patrol will be out on the trails, providing support for cyclists who are struggling or having technical issues. Riders must finish by 5:00 PM.